Drogheda was created in 1992 by guitarist Buddy Mitchell. Striving for originality and extremity, a self-titled demo cassette was released the following year, which quickly caught the attention of Wild Rags Records, who would release the re-recorded tracks plus the Unearthly EP on one CD in 1994. That summer, Dan Haynes joined the Drogheda team on guitar, and the band hit the road. Soon after the fest appearance came the first major personnel shakeup, leaving only Buddy on guitar, and Dan on bass. John Roddy joined them on drums, thus forming the core of the band for the rest of the decade. In 1995, the band released the Kill Extremist full length on their own Extremist Records label. 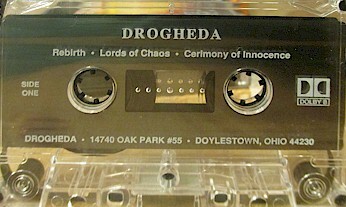 After dismissing that release’s vocalist, Drogheda reworked and re-recorded the songs for the Pogromist full-length. 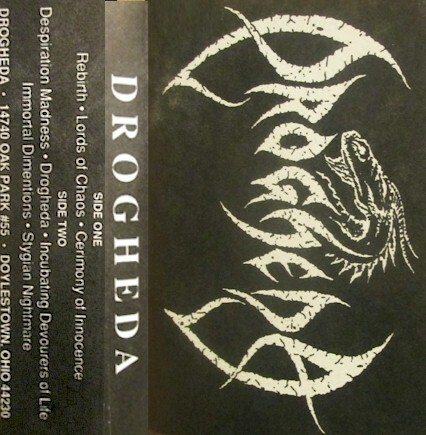 Self-released on Extremist Records, this release debuted what many would come to consider the classic Drogheda lineup consisting of John on drums, Buddy on guitar and vocals, and Dan on bass and vocals.